Dallas has become one of the fastest growing cities in America. It accommodates thousands of weddings every year. It has many natural and rustic areas for a great photo-shoot, beautiful wedding ceremonies, and monumental receptions. Furthermore, some of the most elegant hotel wedding venues reside in Dallas, Texas. We began working on this blog series to help connect couples with their dream venues. Our list of Top 7 Dallas Indian Wedding Venues benefits each couple that wants an amazing wedding weekend. When coming up with this list we thought about events that are part of many Indian Weddings (Hindu, Muslim, Christian and Sikh). Pre-wedding celebrations such as the Garba, Sangeet, and Mehndi nights can be held in the smaller ballrooms, there is a clear path for baraats, and the larger ballrooms are spacious enough for the traditional big fat Indian wedding. This venue lights up the Dallas Skyline with its amazing LED lighting around the building. Couples that want top tier weddings can use one of the two spacious ballrooms the Omni has to offer. This is one of the most popular Dallas Indian Wedding Venues. Here is a recent same day edit from a wedding we did at the Omni for Rohan & Rishika (September 2017). South Indian Groom and Punjabi Bride. They had their Sangeet, Baraat, Wedding and Reception at the venue. The festivities begin with the Sangeet in the Dallas ballroom, then the baraat takes over the streets of Downtown Dallas, followed by the wedding and reception both in the Trinity Ballroom. The video shows all of those events except the reception. The Renaissance Dallas had its additional ballrooms recently built. The new ballrooms are away from the guest rooms but the hotel lobby is easily accessible. The grand ballrooms of the Renaissance have a modern touch to them with solid, dark details along the room and high ceilings. In addition, the terrace has a beautiful outdoor wedding ceremony or cocktail area with an admirable view of the Dallas skyline. This makes it one of the most unique Dallas Indian Wedding Venues. Here are the highlights from Suzette and Anik's wedding weekend at the Renaissance Dallas hotel. We love mixed couples and involving all of their guests in the celebrations which is what the bride and groom love about us. It is important to not only balance out both cultures but also do everything you and your guests will enjoy. The Sheraton’s Lone Star and Dallas Ballrooms can hold thousands of guests which is enjoyable by massive weddings. These gigantic ballrooms can also be split in many different ways to best fit your dream wedding. The Chaparral Ballroom is on the 38th floor and is probably one of the best kept secrets. Large windows that overlook Downton Dallas and it doesn't feel like you are in a hotel ballroom. This is one of the biggest Dallas Indian Wedding Venues. What do you get when you mix a South Indian Bride and a Punjabi Groom? A fun time from the sangeet, baraat, wedding and reception. The Sangeet was held in Chaparral, followed by the Mobile Baraat in the streets of Downton Dallas, and finally the wedding and reception in the Lone Star Ballroom. Check out highlights from Neetha & Sanjay's wedding weekend. The Fairmont exhibits extravagant Italian designs throughout the Venetian ballroom, which gives the feeling of a destination wedding. This is one of the classiest Dallas Indian Wedding Venues. Picture a luxury wedding unlike any other, that is Kiran and Vince's wedding here. Their wedding weekend begins with the sangeet night where the entire room didn't want to leave the dance floor in the Venetian Ballroom. A Lamborghini baraat and beautiful Hindu wedding ceremony inside the International Ballroom. The Regency Ballroom was completely transformed into an outdoor garden theme for their reception as a result of the couple's love for flowers and greenery. Since half of our weddings are mixed cultured events, we get to be a part of the very best weddings in Dallas. Mixed couples love hiring us because we can play it all and make sure everyone is involved. A high-rise hotel that provides a breathtaking view when you say I do. Style meets modernity and is a great place for amazing couples. This is one of the most modern Dallas Indian Wedding Venues. Check out the Altitude ballroom on the 33rd floor, as well as the second floor ballroom named the Great Room. We loved being a part of Corrie & Nate's wedding because they used the entire hotel well. Photo shoots inside and out, ceremony in the Great Room and the reception in Altitude. Couples wonder why we are perfect for mixed/fusion couples. Along with hundreds of Indian Weddings every year, we also perform at quite a few Country, African American, Hispanic and Asian Weddings. Since we do many different culture weddings we are the best choice when wanting to keep everyone happy and on the dance floor. Your wedding is the happiest moment in your life therefore choose a venue you love and the right vendors that will help make your special moment a time you’ll never forget. 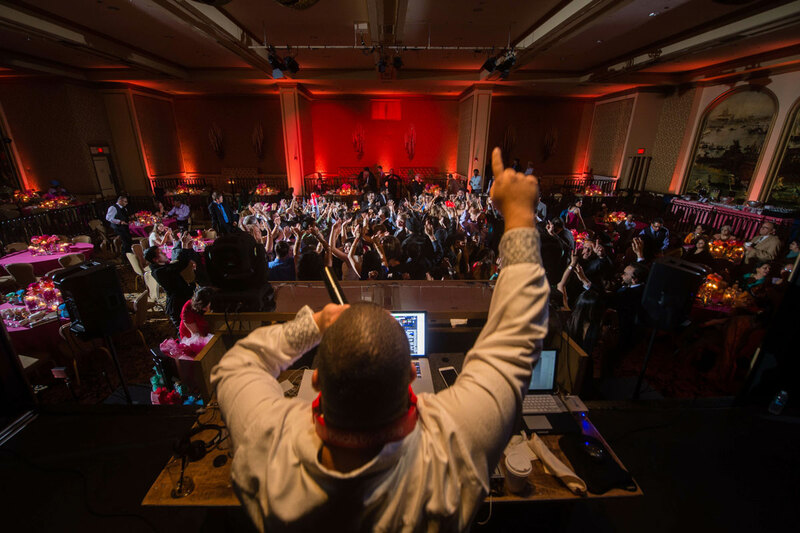 Over our 23 years of bringing joy to thousands of couples, the DJ Riz Entertainment team performed many times at all of these Dallas Indian Wedding Venues and can ensure you will have the time of your lives. Given these points, if you would like to talk about which venue we think is best for you or want more information on our services, contact us here.